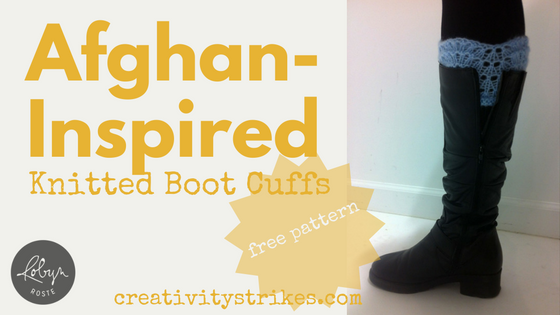 Afghan-Inspired Knitted Boot Cuffs [free pattern] - Creativity Strikes! These lacy boot cuffs have great stretch. In fact they’ll stretch to your leg and bounce back into shape upon washing. For this project any yarn will do and you won’t need an entire skein so it’s a great project for using up stash yarn. I knit these samples with medium weight yarn on 5 mm double pointed needles. This pattern isn’t new but I’ve updated the look and feel.